The outreach program at the Centre for Advanced Microscopy provides an opportunity for high school students to appreciate the application of the wide-ranging world of microscopy. This builds enthusiasm and interest in a range of subject areas, such as biology, physics, archaeology, chemistry and palaeontology, and also provides a valuable tool on which teachers can base their lessons. Our outreach program uses CAM's samples that are directly related to research undertaken at the ANU for investigation, which we prepare for students before their arrival. If teachers prefer, they can make arrangements with CAM staff to supply one of their own samples instead. We will then use a range of microscopes (from light microscope to state-of-the art electron microscopes) to magnify samples, allowing details smaller than 5 nm (0.000005 mm) to be clearly seen. 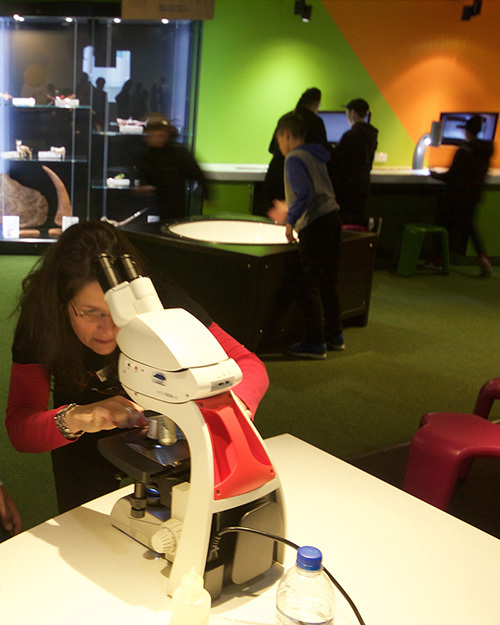 Students will have an opportunity to have some hands-on experience with the microscopes and will have the opportunity to take their own images home. The outreach program is run by CAM staff who are specialists in various scientific disciplines. To enquire about being part of our program, please email CAM, or contact us on (02) 6125 3543. We will then arrange a meeting, to discuss and arrange a suitable time for your students to come and visit us at the Centre. The Kioloa Costal Campus of ANU has an annual 'Discovery Day's program, held in early January. The program includes various holiday activities, walks, talks and demonstrations for curious minds of all ages, led by ANU scientists and artists.